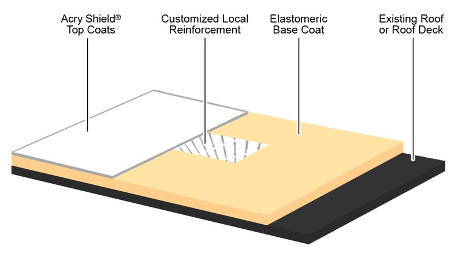 Protect and extend the life of your roofs with AcryShield® Roof Management Systems. These proven seamless roofing repair systems preserve and enhance new or aged metal, sprayed foam, and rubber roof systems simply, safely and cost effectively. You get superior durability and performance with AcryShield and AcryLock™ advanced elastomeric roof coating technologies; and the lower roof maintenance costs and increased weatherproofing benefits will lower the total life-cycle costs of your building. Superior durability and performance compared to traditional roofing. Seamless, fully adhered and watertight. Solutions proven over two decades. Applied over existing roofs without costly tear-offs or landfill waste. Crews achieve much higher productivity versus installing BUR. Extends roof life, lowers cooling energy demand and lowers life-cycle costs. The latest in highly reflective acrylic roof coating technology. Can be applied to the broadest range of substrates including BUR, Modified Bitumen, EPDM, PVC, Hypalon, Metal and Transite.